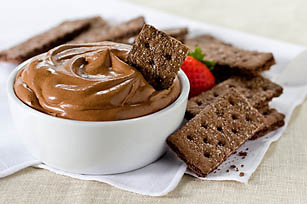 Chocolate graham crackers taste divine with melted chocolate and whipped topping—a blend that's part dip, part mousse and all delicious! Microwave chocolate in small microwaveable bowl on HIGH 1 min., stirring after 30 sec. Stir until chocolate is completely melted. Whisk in 1/2 cup COOL WHIP until well blended. Whisk in remaining COOL WHIP. Garnish with a sliced strawberry just before serving. Or grate additional BAKER'S Chocolate and sprinkle lightly over dip just before serving. Dip can be stored in refrigerator up to 2 days. 1-1/4 cups dip or 10 servings, 2 Tbsp. dip and 8 cracker pieces each.